This week I posted some of the DIY wedding ceremony projects I created when I tied the knot last year, but of course I didn't stop there. Our wedding reception was filled with even more DIY wedding projects, starting as soon as guests walked in the door. 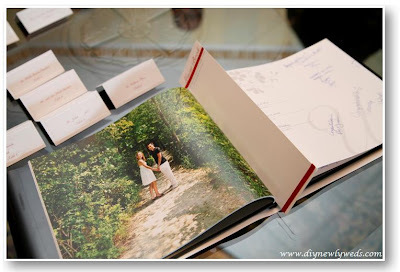 Instead of a typical wedding guest book, I created a photo book filled with our engagement photos and the story of our relationship. I left the last few pages of the book blank for guests to sign and created a bookmark asking guests for their well wishes and showing them which pages to sign on. The bookmark was made from cardstock and had a red ribbon stripe glued to the top and bottom for a finishing touch and to bring in our wedding colors. 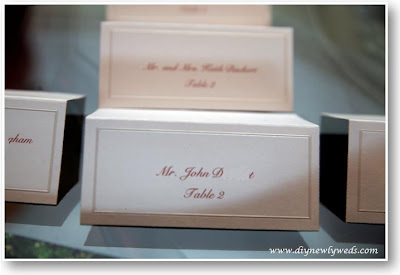 A super easy wedding diy project was creating personalized place cards. I simply bought printable placecard paper, complete with perforations, and printed our guests' names and table numbers using our red ink and the same font I used for other projects, like our wedding programs. Once guests found their table on their place card, the table numbers were another diy project. 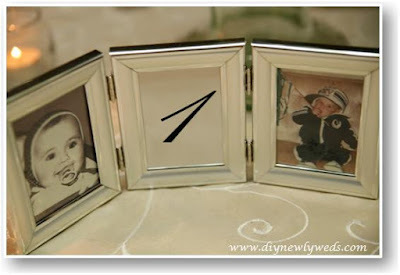 I created the table numbers from three-photo frames I found at the Dollar Store of all places. The center photo contained a table number I simply printed out from my computer. But what made these table numbers so special, was the two other photos in each frame. For each table number, I placed a photo of each of us at that age. So table #1 had photos of each of us at age one, and so forth. The table numbers were a hit and were a fun and easy way to add a personal touch to each table setting. How about your wedding, what type of DIY projects did you do?